Welcome to Vom Issam Haus. If you are first time German shepherd puppy buyer or visitor to this site, it is our hope that you will find the information available here helpful, in the decision making process of purchasing your German Shepherd puppy pet. There are numerous German Shepherd Breeders in Ontario, and selecting the right addition to your family can be challenging. American Lines vs. German Lines? The CKC (Canadian Kennel Club vs. the S.V (Verein Fur Deutsche Schaferhunde). Show quality vs. Pet quality. All the jargon that made your head spin. What does it all mean? Absolutely nothing, if you happen to be the owner of “That Dog.” The dog that is considered to be the neighbourhood terror. Either because the dog is untrained and pulls you down the street. It barks non-stop or for whatever the reason is aggressive towards adults, children or other animals. The majority of German shepherd puppies sold in Canada, go into pet homes. Families, in communities with neighbours, children, and seniors. You may live in a house, condo or an apartment building. Whatever the case, the early beginnings of your German Shepherd Puppy pet matters along with where you purchased your new family member. See, breeding German Shepherds is no easy task. As a breeder I have to make sure that the puppies I produce are of sound and clear temperament and I have a responsibility to make sure that those puppies go to their forever home if I decide to sell any of them. 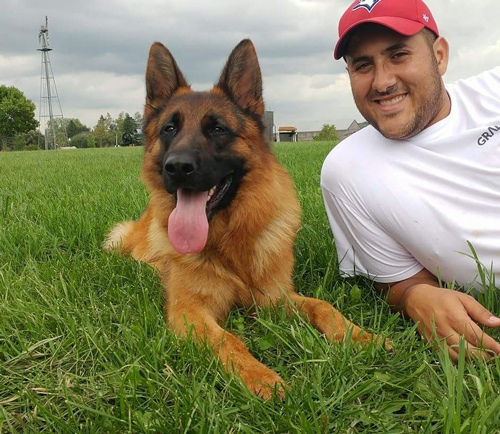 Having said that, Vom Issam Haus German Shepherd Breeder, Ontario breeds the West German Working Show line German shepherd dog. We have found that this line offers a happy medium, with the ability to work and also be a loyal family pet. Our breeding philosophy is that we only acquire the best of the best. We research and study every breeding, with emphasis on genetics, health, anatomy, conformation, disposition and most of all TEMPERAMENT. If you have no temperament, you have no dog. Whatever your lifestyle is, it is imperative that you select a German shepherd puppy from a German Shepherd Breeder who makes, health testing, temperament, training and sanitary conditions, the only priority. The founder of Vom Issam Haus is that German shepherd breeder. As an ex-Police Officer protecting Canadian communities for ten years prior to becoming a very successful Paralegal, advocating for your rights in the Legal Industry. He has seen first-hand that sometimes the world isn’t a safe or fair place. He purchased his first male German shepherd as a pet and quickly learned the intelligence, loyalty, and guardian instincts the Breed has. He began taking training classes, completed work in Schutzhund, entered and participated in show exhibition under some of the world best German Shepherd Judges and was hooked. Vom Issam Haus is a German shepherd kennel, dedicated to the continuation and improvement of carefully selected German Bloodlines for work, show, family companionship and protection. We promote the total German Shepherd (GSD), both in structure, health and temperament. Our dogs are tested prior to breeding and have certified healthy hips, excellent health, and outstanding temperament. Our dogs are partnered according to bloodlines, health, structure, and working ability. The German Shepherd Dog is the most popular breed in the world, famous for its intelligence, loyalty, and guardian instincts. Being a German Shepherd Dog breeder is a huge responsibility, because the expectations are so high. At Kennels Vom Issam Haus we know German Shepherd Dog, it is our calling and profession, and we are delighted to share this with you. Prior to getting a Schutzhund title, every dog must pass a Temperament Test (BH) – a test to verify stable temperament among strangers and traffic, and an obedience test. Every breeding dog has to have a Körung evaluation – where the dog’s temperament and structure are thoroughly examined. Körung also includes a courage test. To get a VA rating (Excellent Select) the dog must meet all of the above requirements plus must have at least a SchH 2 title and possess outstanding structure. The VA rating is only awarded at the Sieger show (a yearly national or world championship) where hundreds of German Shepherds compete. When purchasing German shepherd dogs, one should always be aware that many German shepherd dogs are not suited for breeding in accordance with these guidelines. The list of requirements for breeding has grown over the years tremendously. Today, a German shepherd dog has to be evaluated for character, temperament, control in urban environment, and endurance. The dog must possess suitable hips. Moreover, it has to pass a breed survey that is called Körung. It is performed by a qualified breed master (Körmeister). A dog can be recommended for breeding (KKL 1), or at least be classified as suitable for breeding (KKL 2). However, many German Shepherds have not been evaluated according to this procedure or failed the test, and hence may not be used for breeding. So, when you are interested in purchasing a German shepherd dog, please help to keep the standards for German shepherd dogs high and inform yourself carefully about the breeder, the breeding stock and the qualifications. Vom Issam Haus will endeavor to answer all your questions. Please do not hesitate to reach out to us by phone or email. Visits are ALWAYS encouraged and welcomed. “we went to the Vet yesterday as per agreement, he is healthy boy they said, they gave him against flees (revolution), he was pretty much “down” whole morning and afternoon, but after the Vet visit and couple of good reliefs he is very active. I think we have super smart guy as well. He already knows Sit command before meals and he hasn’t have any accidents in the hause. Just wanted to let you know that Maddie is doing great!! She’s settling in really well and I haven’t had any problems! I love her!! I’ll keep in touch as she settles in, and if any problems come up I’ll let you know. Please let the other Sam know how well she’s doing! A Family Pet that will protect the home vs. a Family Protection Dog. How do you select the right puppy for your family? How do you pick the right breeder?